The doctors and staff welcome you to Associate Foot Specialists Clinic in Calgary, Alberta. 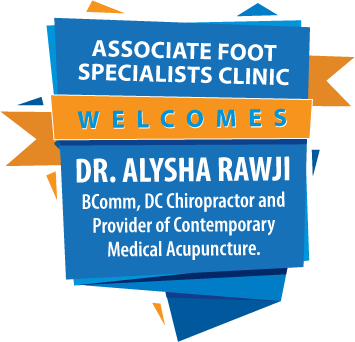 Our practice is dedicated to providing the best possible foot and ankle care to adults and children in a pleasant and caring environment. After completing undergraduate studies, our doctors achieved a four year degree in podiatry, followed by a two year surgical residency. The Associate Foot Specialists Clinic was voted Consumer Choice Award winner in 2016 and 2017 for business excellence. Since the mid-1990s, Dr. Darryl Gurevitch and Dr. Jason Gurevitch have provided complete podiatric care to patients in Calgary and the surrounding areas. We believe that early diagnosis, intervention and prevention are essential to the care of your feet and will help you maintain an active and healthy lifestyle. Contrary to popular opinion, foot pain should not be a regular occurrence. This website is designed to help visitors learn more about our office and common foot issues such as callouses, corns, nail care, heel pain, bunions, hammertoes, heel spurs, sport injuries, trauma/fractures, warts, foot pain, neuromas, ingrown toe nails, neurological, vascular and dermatological conditions, as well as other concerns related to the foot and ankle. We are also very experienced with diabetic foot care. The podiatrists at Associate Foot Specialists Clinic personally cast custom orthotic shoe inserts specific to your individual needs. We work closely with primary care physicians and other specialists to ensure the most effective treatment is provided. NO REFERRAL IS NECESSARY TO BOOK YOUR FIRST APPOINTMENT. Podiatric medicine in Alberta is considered an allied health service, and is partially funded by Alberta Health and Wellness. Benefits payable to each resident of Alberta for podiatric services are limited to a maximum of $250.00 for each benefit period. In the form of a co-payment, the patient contributes to the total cost of the treatment, based on recommendations from the Alberta Podiatry Association. Free parking upon availability. Our clinic offers two hours of complimentary parking in any unreserved slot, upon availability. An Impark Parkade is located on the north side of our building and can be accessed from the south side of 18th Avenue. Simply drive up the ramp and park. You will be asked to register your license plate with us upon arrival at the clinic (do not stop at pay station). Both metered and unmetered street parking are also available nearby. Please note that meters do not start until 9:00 a.m. daily. Suite 1520, 1800 – 4th Street S.W. Years Serving the Calgary Area. Number of Feet We've Treated.